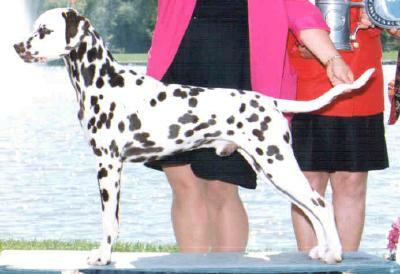 Pixel is a multiple specialty WB/BOW with wins under breeder judges Molly Martin (Atlanta Specialty 1996) and Sue MacMillen (Mid Florida Specialty 1997). Breeder-handled to her title with three majors, including two on the tough Florida Circuit. Beautiful sidegait, intense liver spotting, tight feet and a wonderful temperament. Pixel proved to be an wonderful hiking companion and study partner for Sarah during veterinary school. A six month survivor of liver cancer, Pixel left us suddenly through a tragic accident. She is greatly missed. All images are the property of Woodwynd Dalmatians and may not be used without our express permission and that of the photographer.